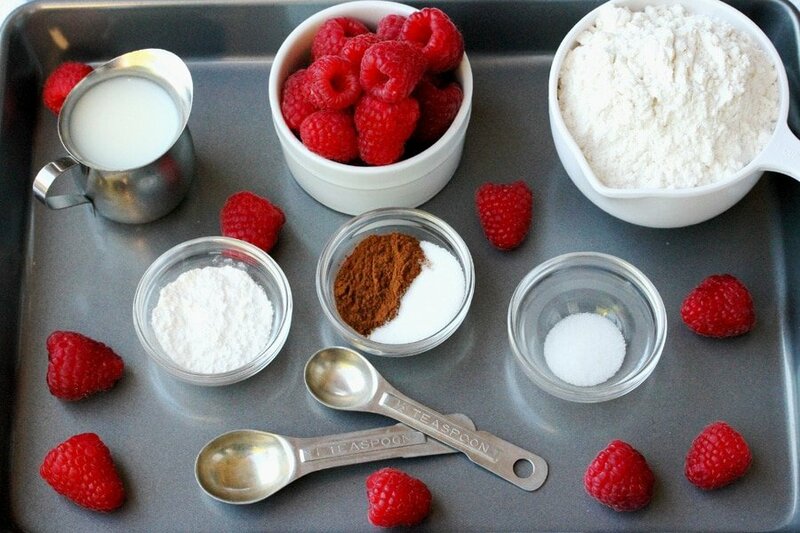 Have you ever tried the combination of cinnamon and raspberries together? This is really a simple recipe. 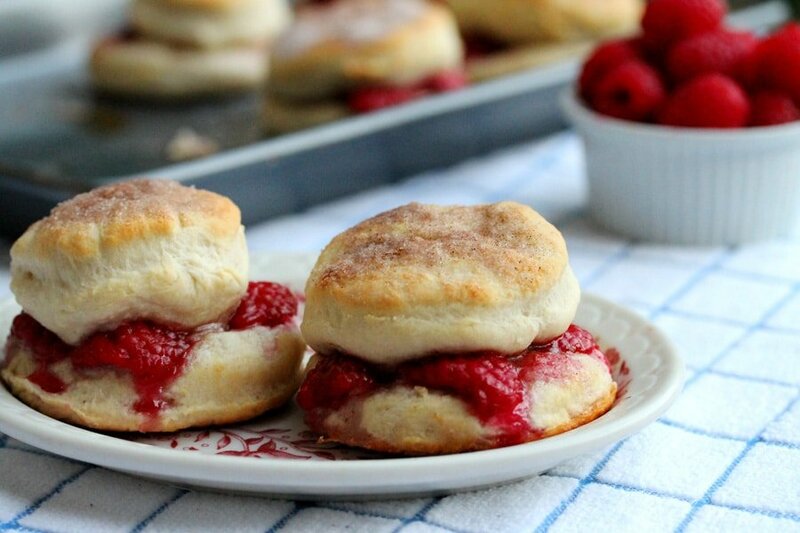 These are basic baking powder biscuits that are baked with fresh raspberries, butter and a lot of cinnamon and sugar in the middle. 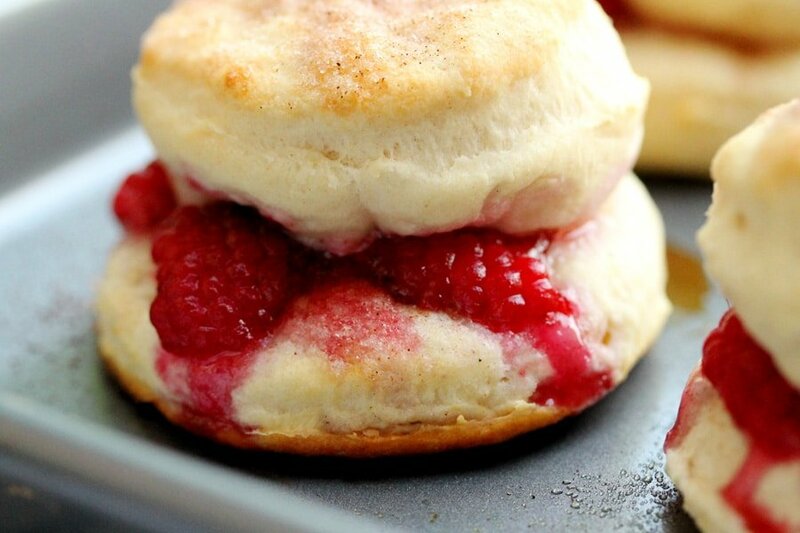 Kind of like a raspberry biscuit pie sandwich! 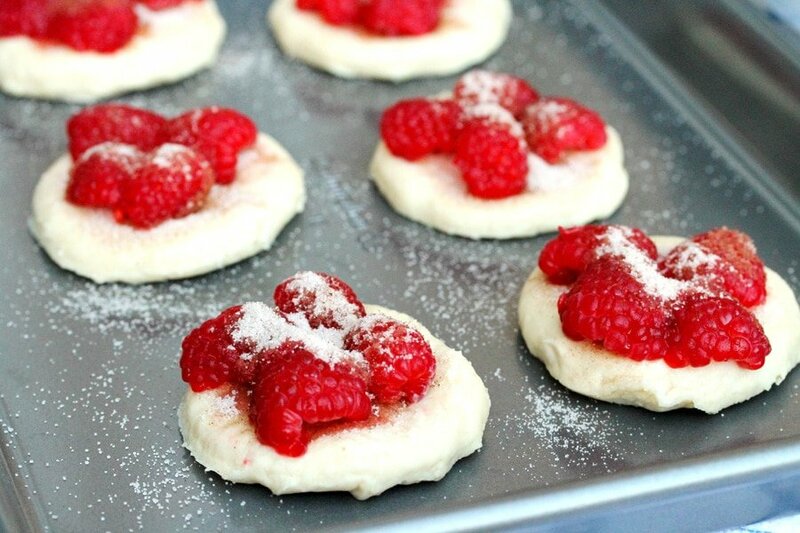 They taste so delicious and can be made with other fruit fillings if you prefer. 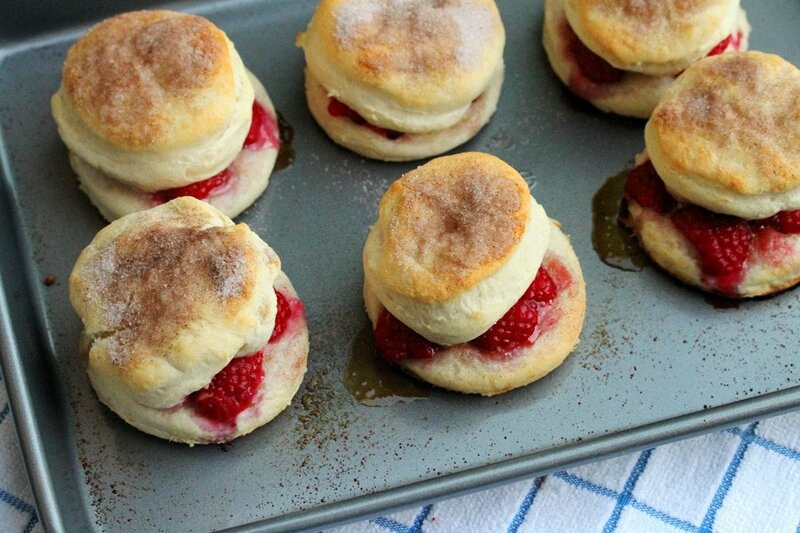 And the best part is that you get two biscuits in each serving! Ultra delish! One last thing….they are really tasty served warm right out of the oven. But, if you have leftovers, they keep great in the refrigerator. When I’m in a hurry I’ll grab one and just eat it cold with a bit of butter, and to me, it tastes kind of like a jelly filled donut! …and you’ll also need about a cube of butter. ……..into a medium size bowl. Then add the butter to the sifted ingredients. Use a fork to cut in the butter. 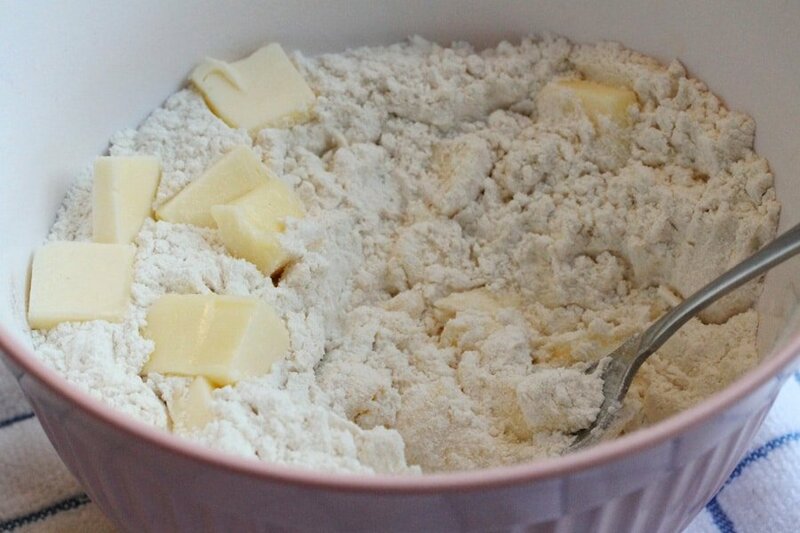 Keep smashing the butter into the dry ingredients…. …..until the mixture has crumbs in it like this. Then make a well in the middle. 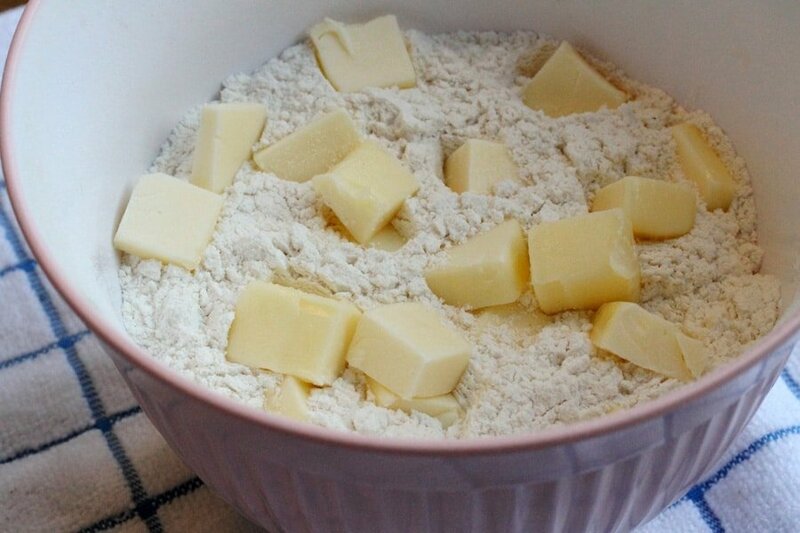 And add the milk to the “well”…..
….and mix it quickly with a fork until…..
….the dough sticks together like this. 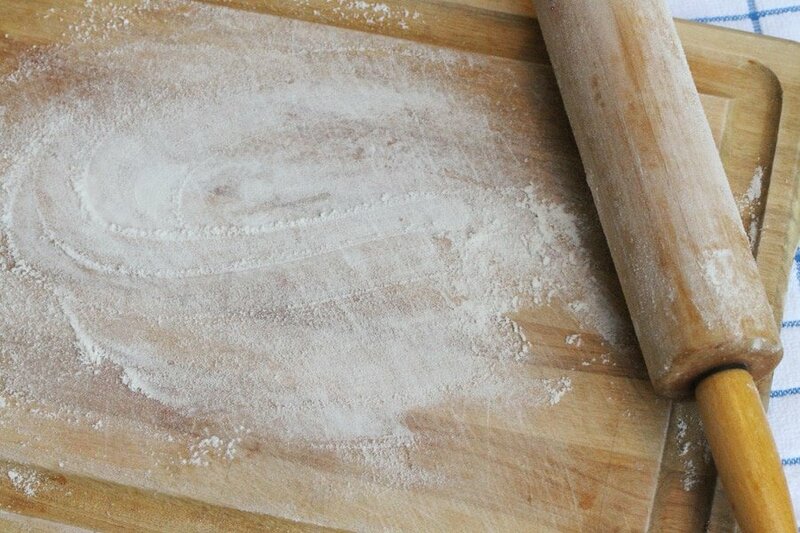 Sprinkle some flour on to a large cutting board. …or slightly more if you still see some lumps of flour. 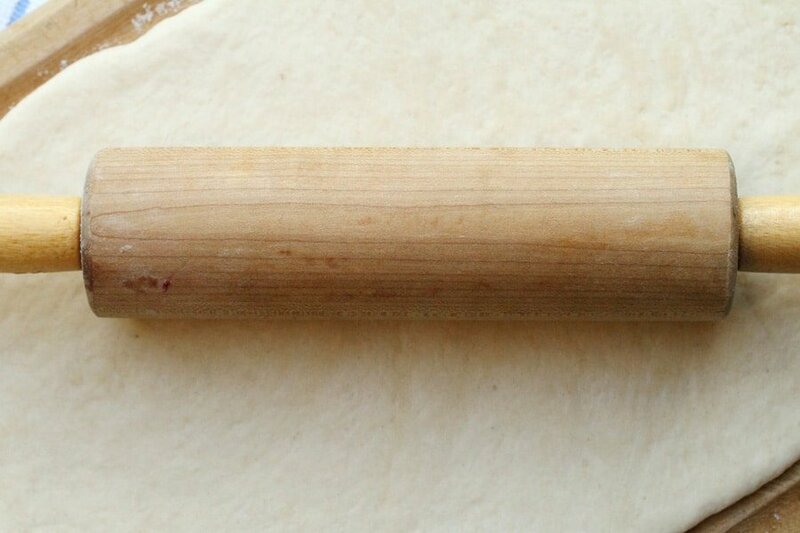 Dust the rolling pin with flour and roll the dough until it’s about ½ inch thick. 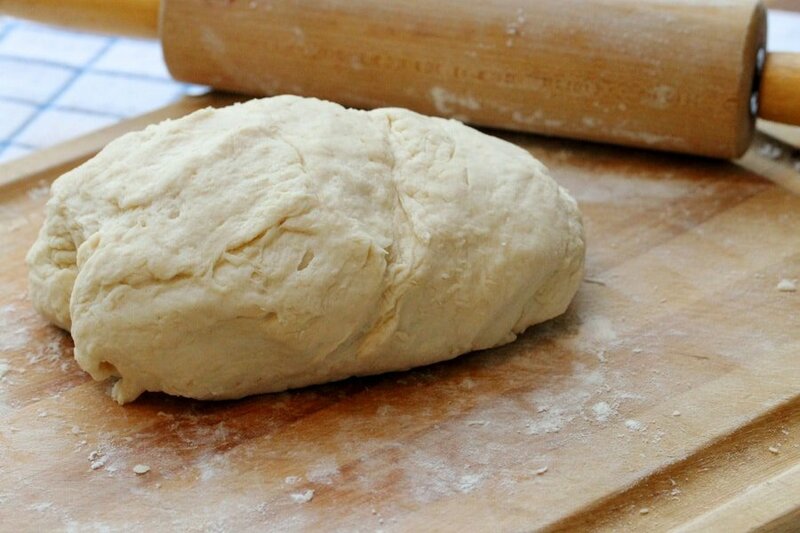 You may need to add a bit more flour to the cutting board or rolling pin if the dough is sticky. 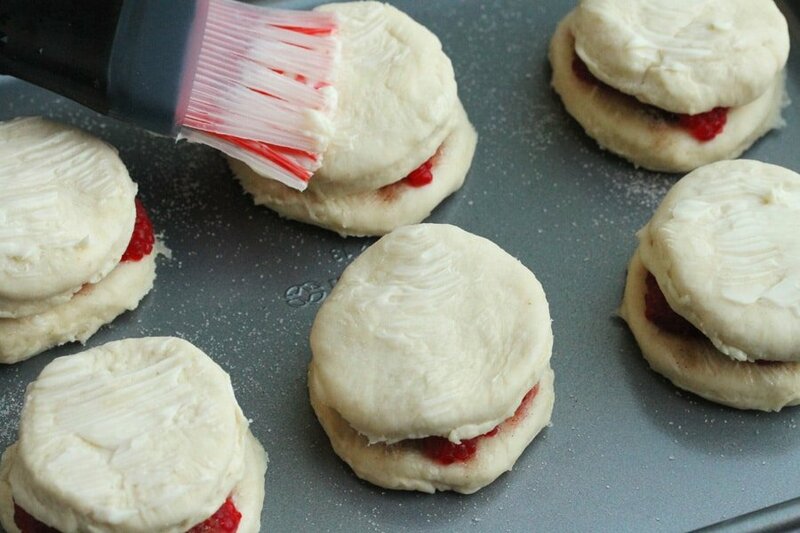 Using a biscuit cutter (or the top of a glass), cut the dough into 6 circles. 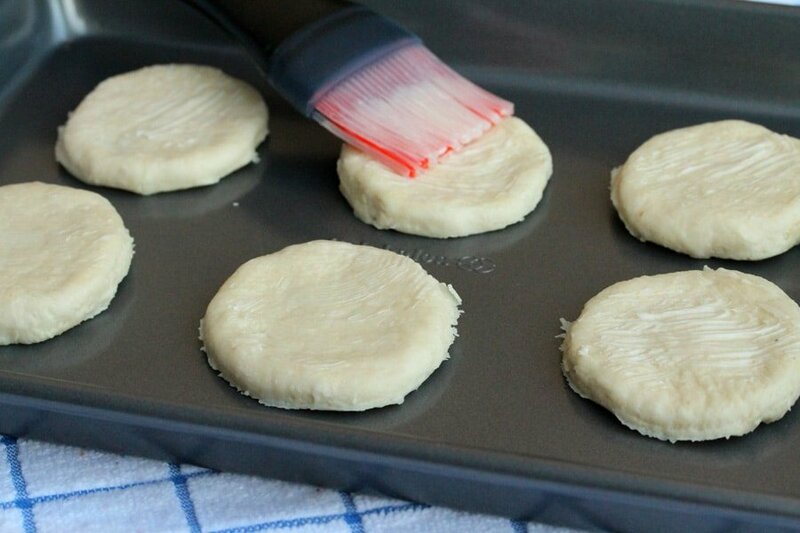 Add just 6 of the dough circles to an ungreased cookie sheet. 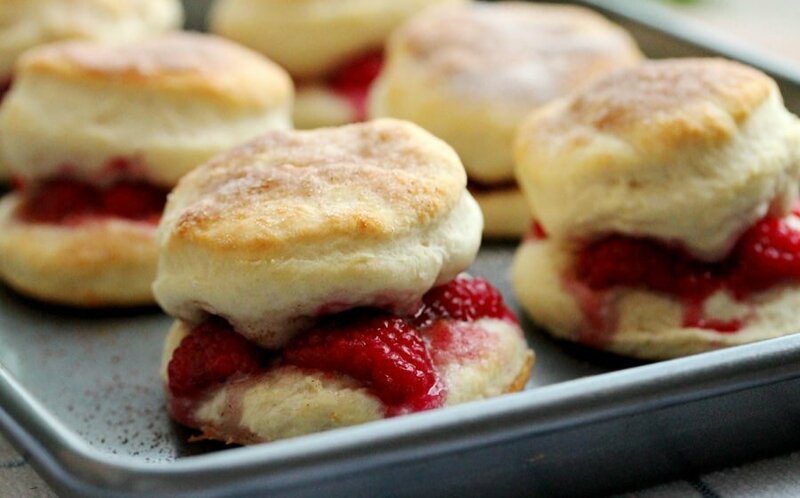 Brush some softened butter over the top of the biscuits. 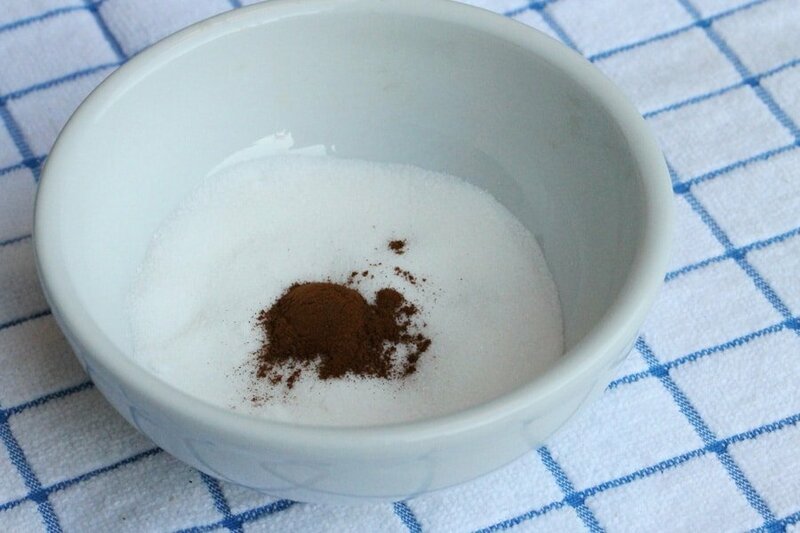 Add the sugar and cinnamon to a small bowl. ….and sprinkle it over the top of the buttered biscuit. 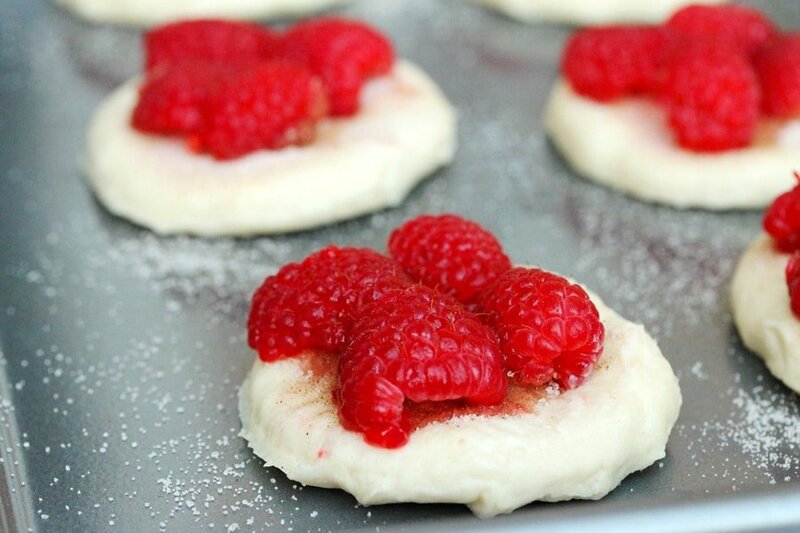 Cut the raspberries in half lengthwise. 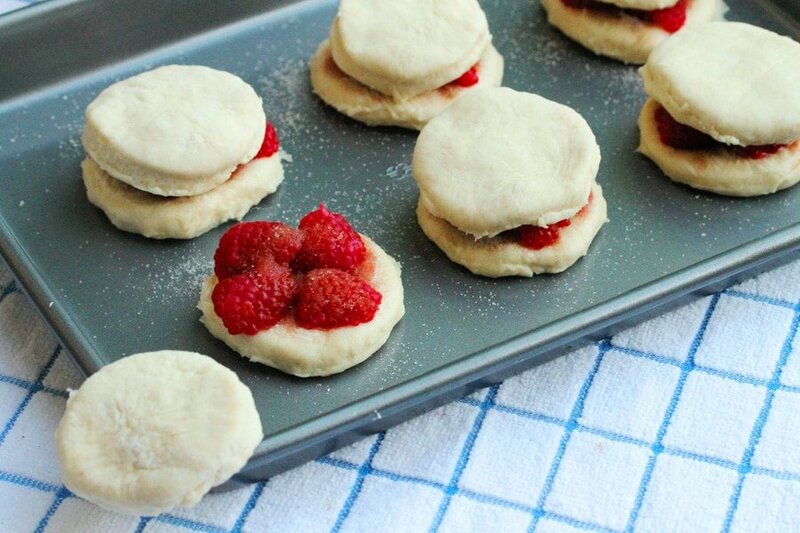 Top each biscuit with 4 to 6 raspberry halves depending on the size of the berries. You can use other berries if you prefer. Or combine different berries together. Sprinkle some of the cinnamon and sugar over the top of the berries. 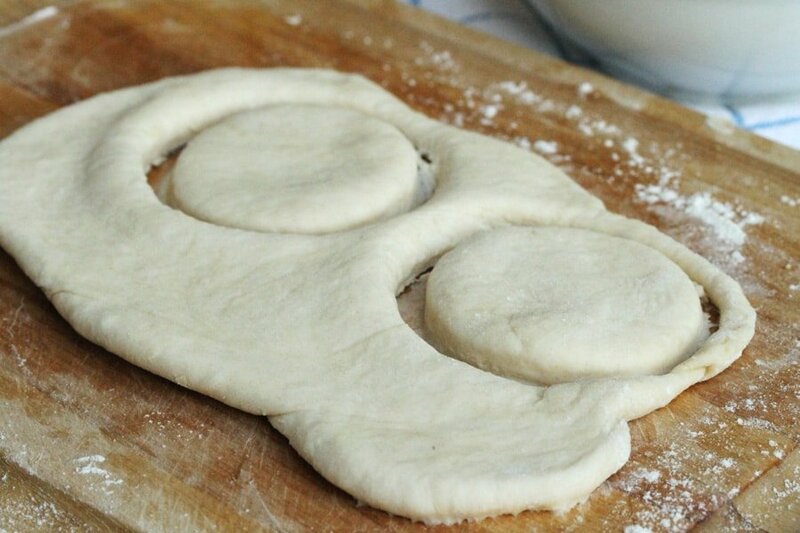 Roll the remaining dough, and cut it into another 6 circles. You may need to roll and cut them out two at a time since the scraps are being re-rolled. 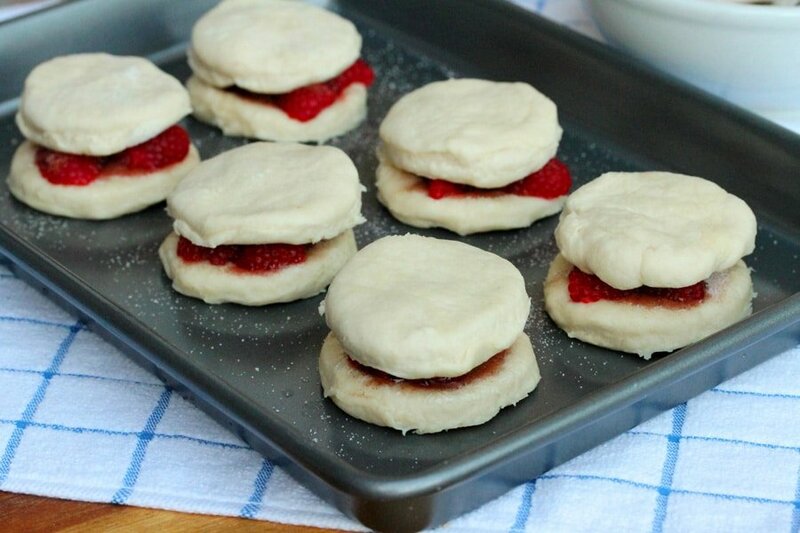 Top each raspberry biscuit with one of the remaining dough circles (like a sandwich). If some of the dough circles are smaller than other ones that’s just fine…it will give them some character. Spread some softened butter on top of the biscuit dough circle. Feel free to slather it on thick too. Then top with more cinnamon and sugar. Feel free to add a lot of the cinnamon and sugar. 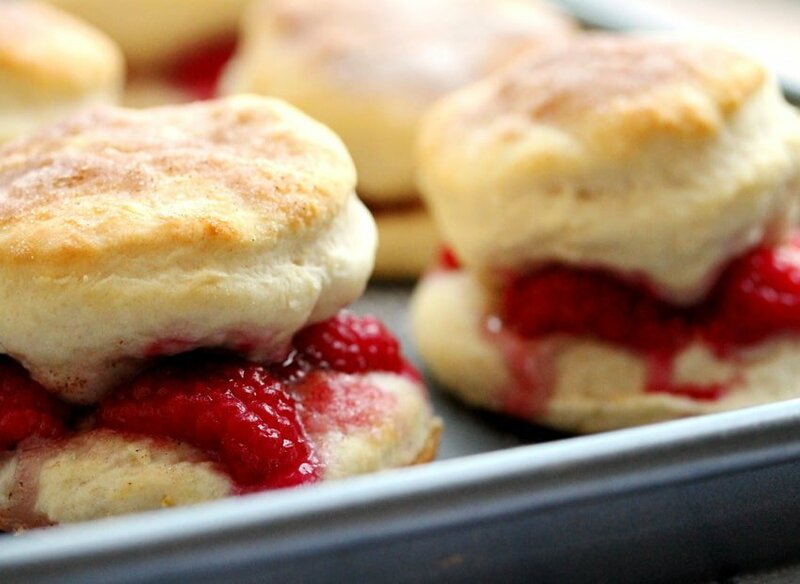 It’s a great way to top off the biscuit. 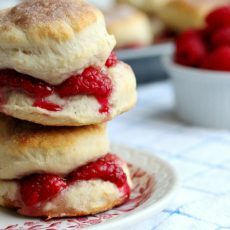 Bake in a preheated oven for about 12 minutes or until the biscuits turn a light golden color. Or just eat them right off of the cookie sheet. They taste soooo good. 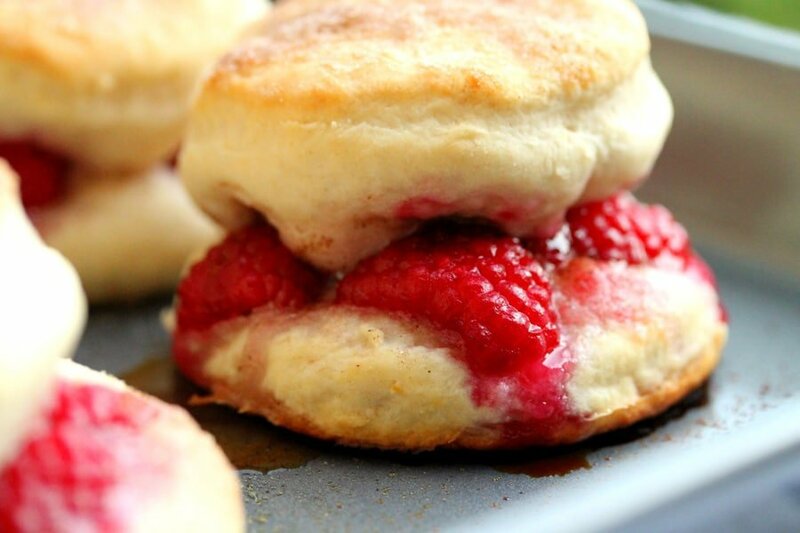 You can even add more butter to these….why not. The juice from the berries mixed with the cinnamon and sugar is amazing. 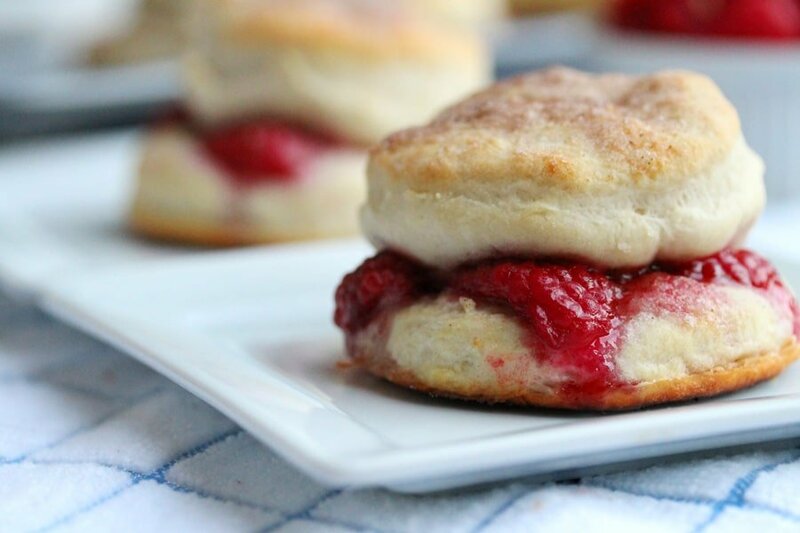 These biscuits are delightful for breakfast, a snack or even dessert. 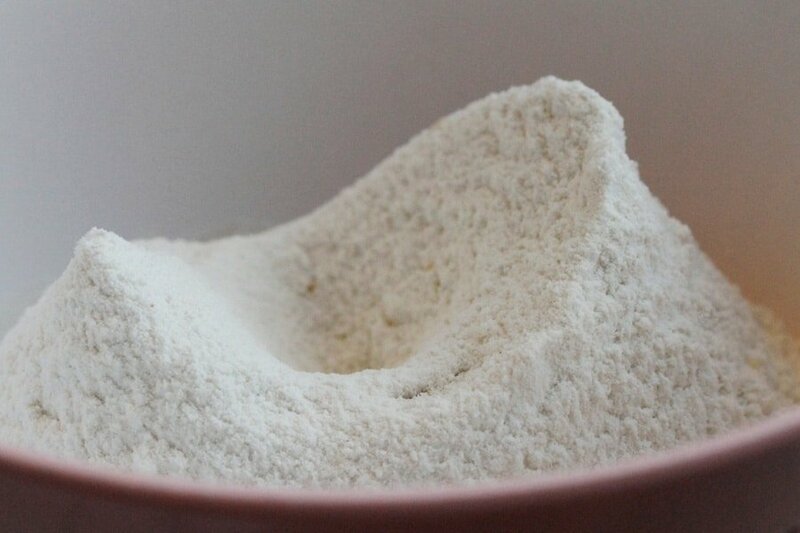 For the Biscuit Dough - Sift the flour, baking powder and salt into a medium size bowl. 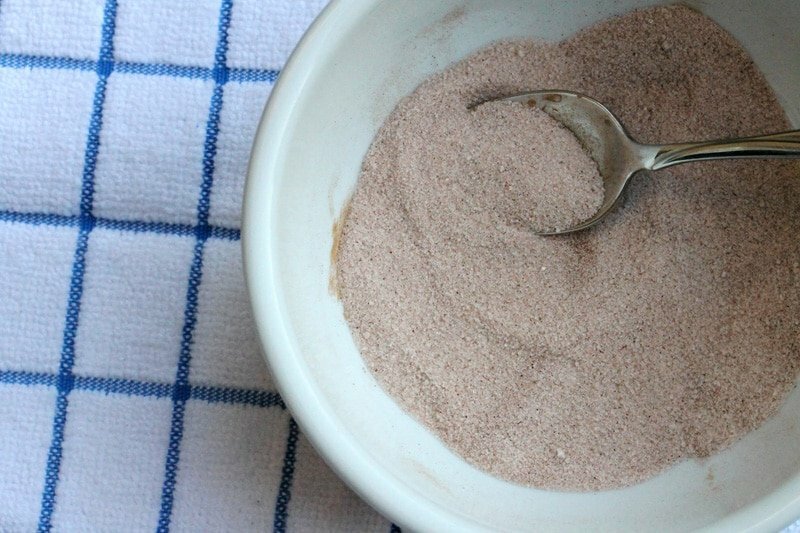 If a sifter isn't available, add these ingredients to the bowl and whisk them together. 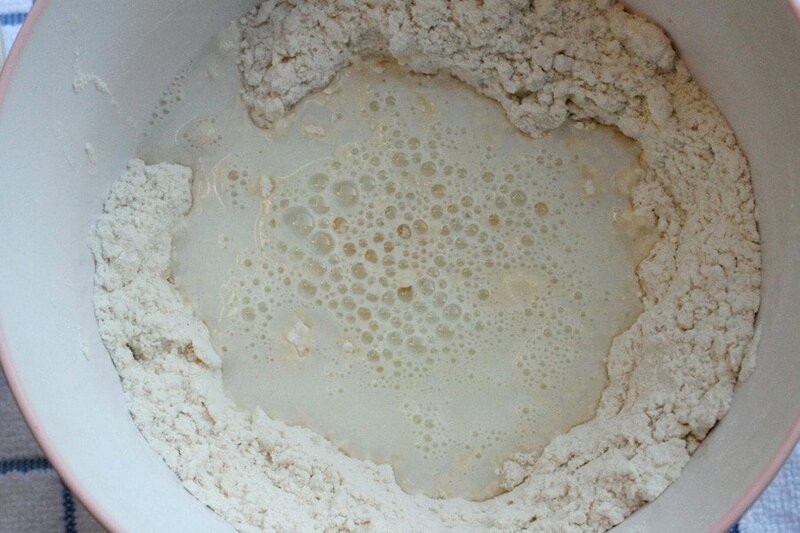 Whisking has a similar effect as sifting does. To the bowl, add cold butter. 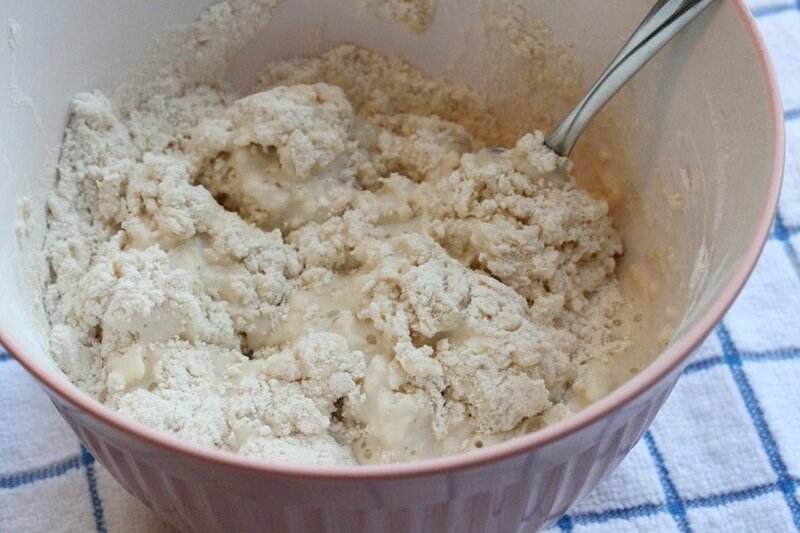 Using a fork, cut the butter into the dry ingredients until the mixture looks like coarse crumbs. Then make a well in the middle of the dry ingredients. 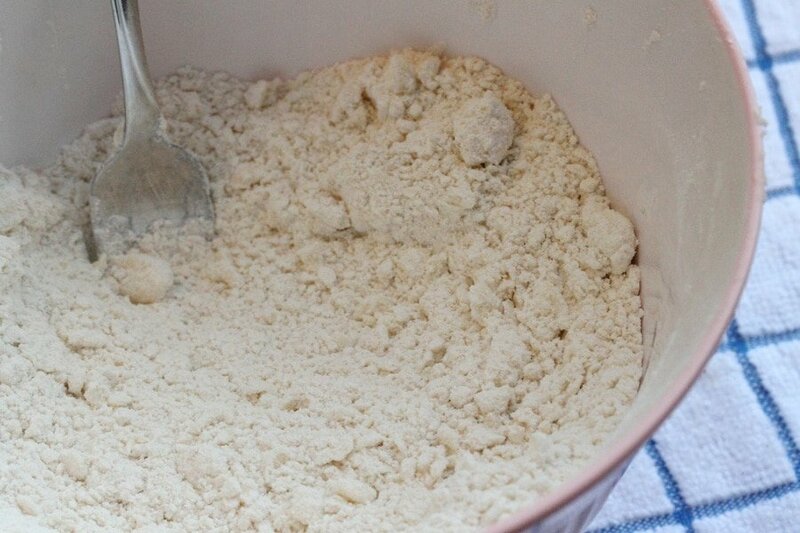 Add the milk to the “well” and mix it quickly with a fork until the dough sticks together. 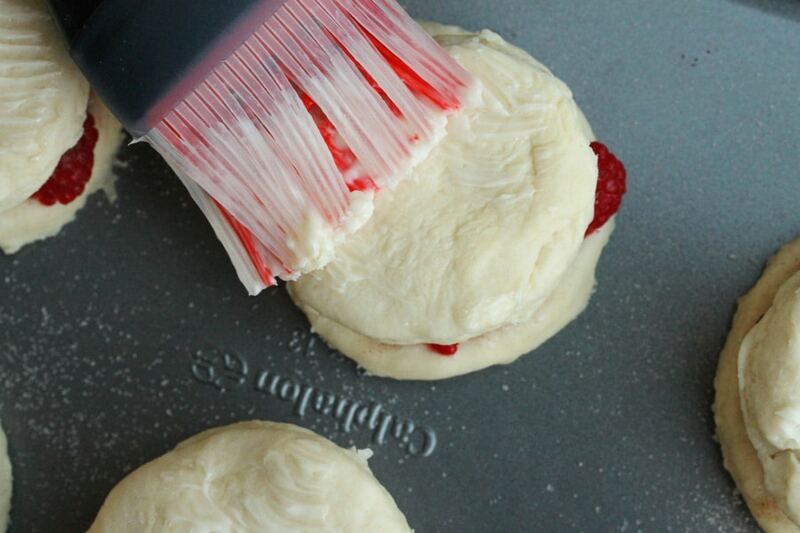 Sprinkle a little flour on to a large cutting board. 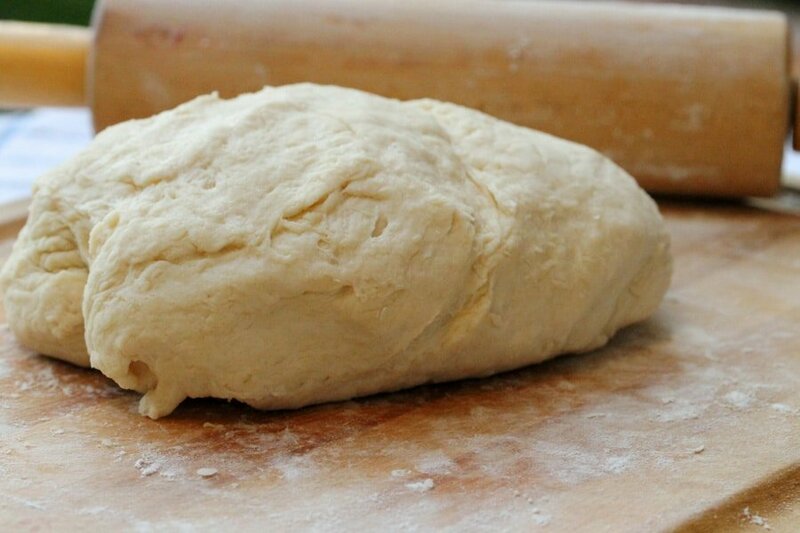 Add the dough to the cutting board and knead it gently about 10 times. 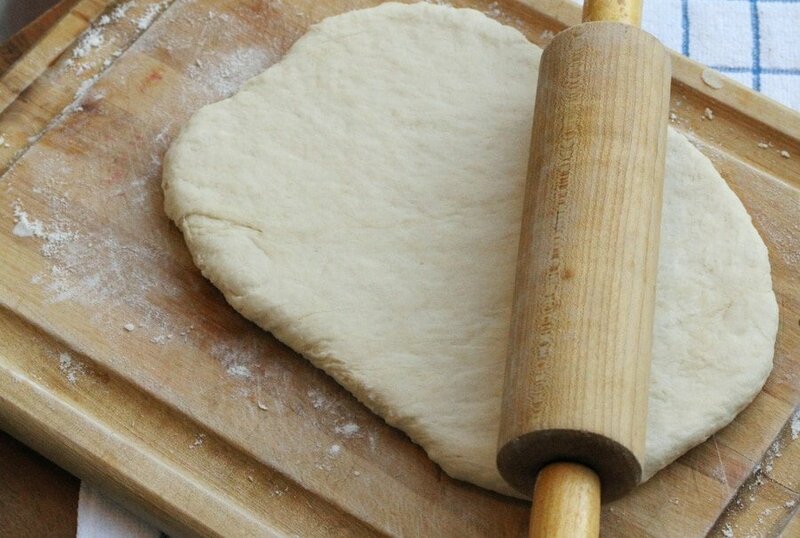 Rolling the Dough - Add a bit of flour to a rolling pin and roll the dough until it’s about ½ inch thick. 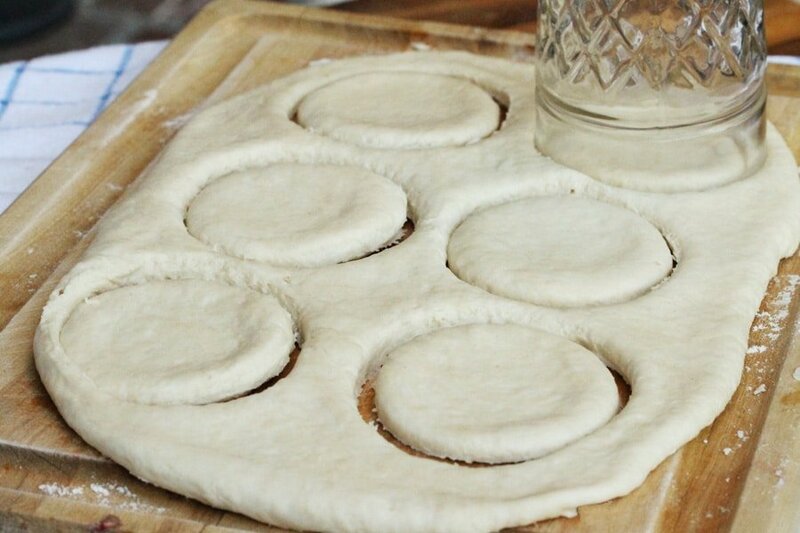 Using a biscuit cutter (or the top of a drinking glass), cut the dough into 12 circles. 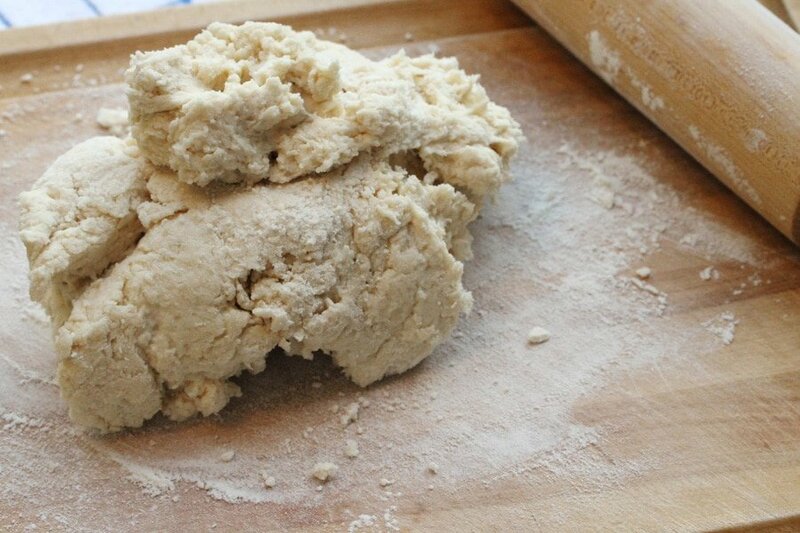 To an ungreased cookie sheet add just 6 of the circles of dough. 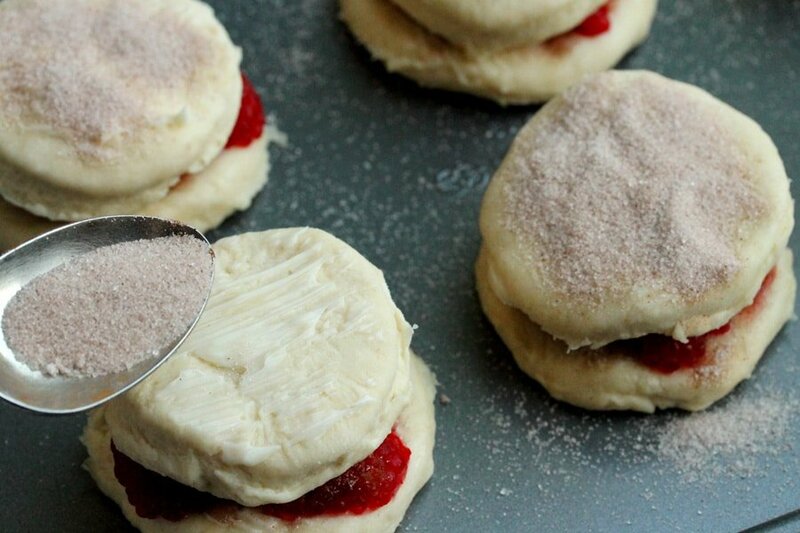 Brush half of the softened butter over the top of the biscuits. Set aside for a moment. For the Cinnamon and Sugar Mixture - In a small bowl, add cinnamon and sugar. Mix together. Sprinkle it on top of the buttered biscuit. 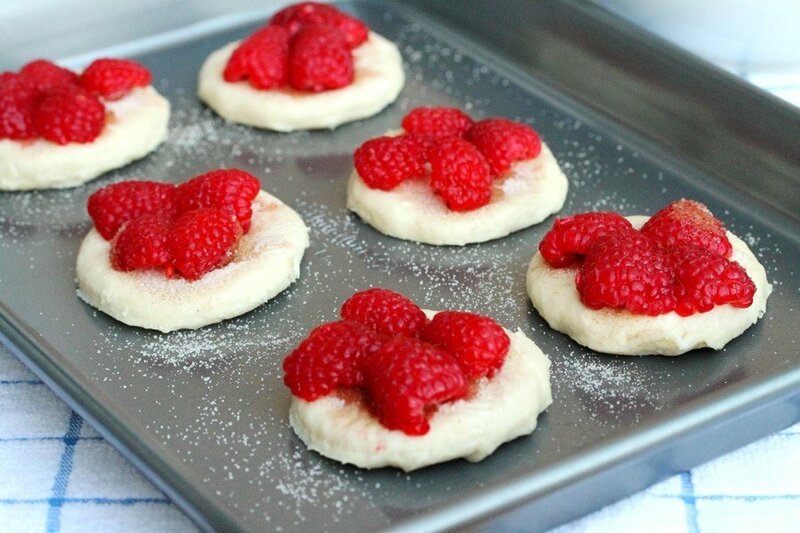 For the Raspberries - Top each biscuit with 4 to 6 raspberry halves depending on the size of the berries. Sprinkle the cinnamon and sugar over the top of the berries. 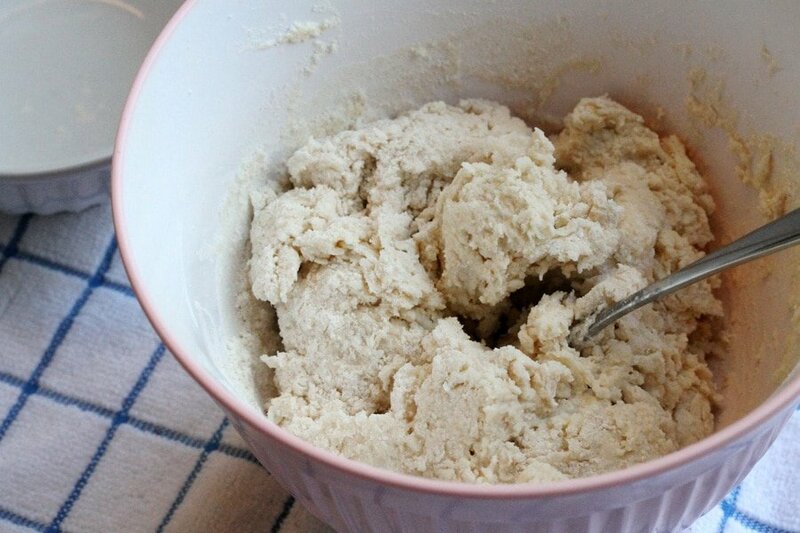 On the top piece of dough, spread softened butter. 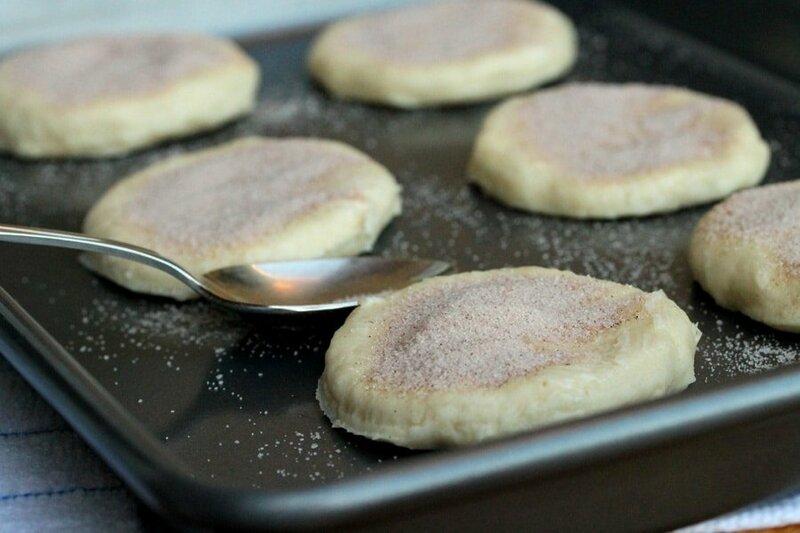 Then top with more cinnamon and sugar. 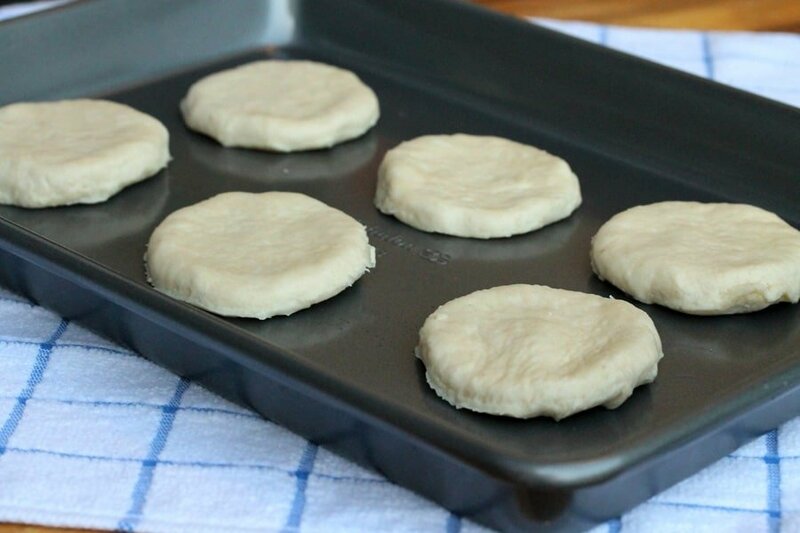 Baking the Biscuits - Bake in a preheated oven until the biscuits turn a light golden color (about 12 minutes). 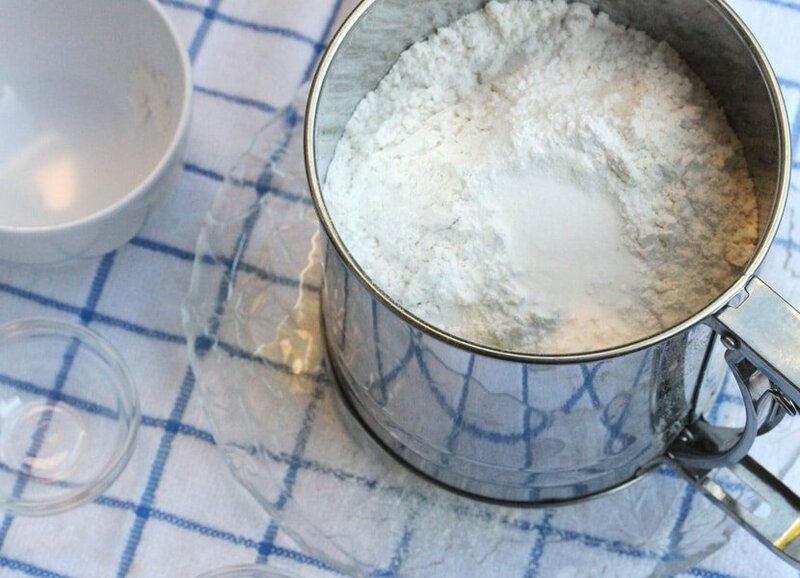 If a sifter isn't available, add these ingredients to the bowl and whisk them together. Whisking has a similar effect as sifting does. Hi Malin, yes, for sure I’m putting whipped cream on these next tiime! These look so delicious and so pretty! I know they’d be a big hit with my kids. Can’t wait t try them! Hi Tesa, thank you and thank you for stopping by. What a great idea! 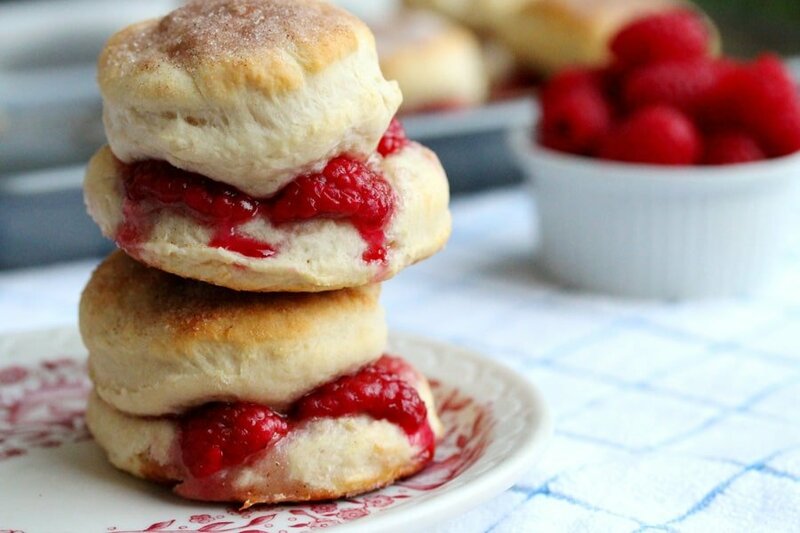 It’s kind of like a warm strawberry (or in this case raspberry) shortcake. I don’t think a dollop of whipped cream would hurt either! Hi Jana, yes for sure…whipped cream would be great on this! After seeing this, my thoughts of biscuits will never be the same. 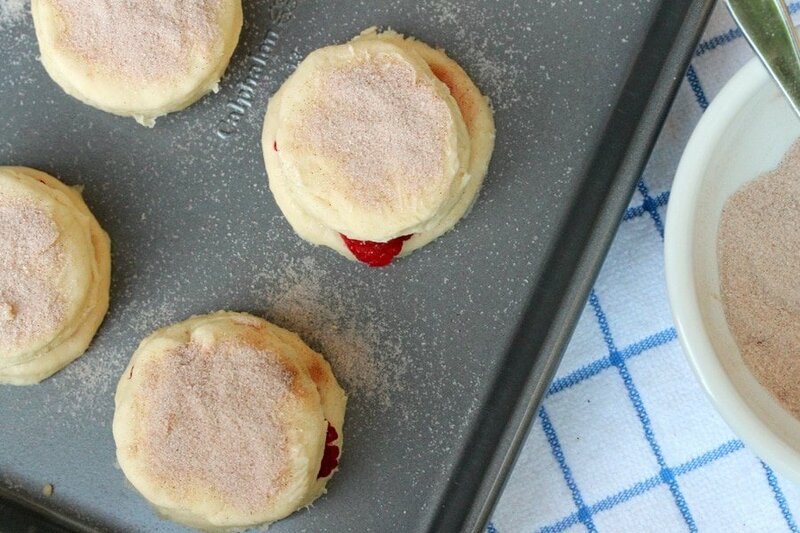 It will be hard to settle with just putting butter on them-these look delicious! 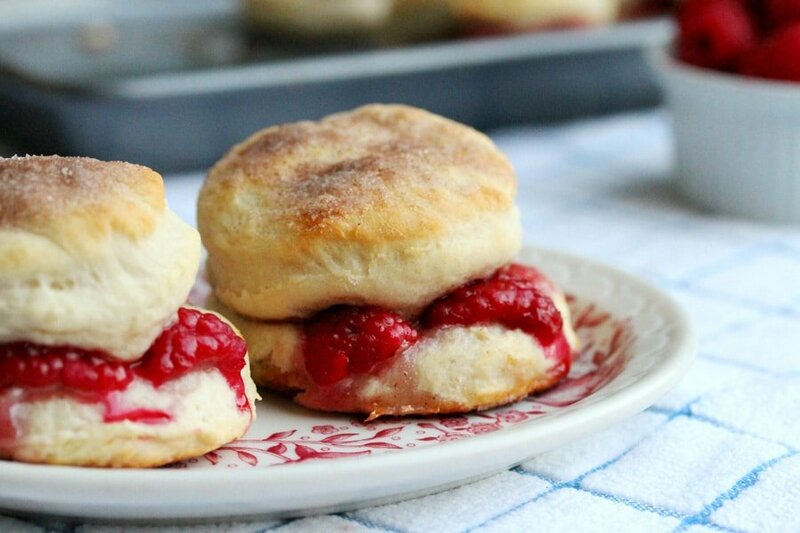 All those raspberries inside that fluffy biscuit…how I would love to have a few with my morning coffee. Thanks for sharing this creative treat-yum! Hi Vanisha, I’m glad you liked it. Have a great day!